Scones are arguably the most popular component of a traditional afternoon tea. It’s a rare tea room review that we receive at TeaGuide that does not reference the scones served – whether they were too small or too large, too hard or too doughy, or happily just right. 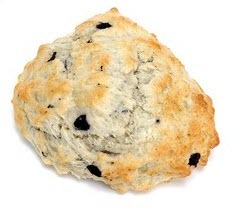 The first scones were cooked up in Scotland in the early sixteenth century. These were essentially griddle-baked raised oatcakes, formed into large rounds and cut into wedges for serving. Nowadays scone bakers more often use wheat flour and cut them into rounds. Recipes for scones generally call for butter, milk, or cream, and are served with clotted cream, butter, and jam. Someone once told me that the whole point of scones is to provide a foundation for holding as much cream and jam as possible! While this pleases most tea lovers, those of us who follow a purely vegetarian, or vegan, diet – abstaining from all animal-based products – often find ourselves having to pass on eating scones. I’m hopeful that this may change as more people turn to a vegan diet, whether for philosophic or for health reasons. Even former President Bill Clinton – once the poster boy for double bacon cheeseburgers – not only joins daughter Chelsea as a vegan, he is very vocal in his support for this cholesterol-free dietary plan. In response, a growing number of restaurants, including tea rooms, either offer vegan menu choices or will alter dishes to suit. Meanwhile, vegans can make our own scones by substituting vegetable shortening and non-dairy milk for the dairy products. I prefer coconut or palm oil shortening and plain soy milk, although you can use vegan margarine, light vegetable oil, rice milk, and almond milk. If you use a scone mix, be sure to read the ingredients carefully; many incorporate dairy products. I like the mixes from Victorian House Scones – especially the oatmeal. Their website features mixing instructions for a vegan variation, provided by yours truly. I also like that they are baked in the original wedge shape. The following recipe for scones came to me from my friend Sophia. Whether you’re a vegan or not, give it a try – they’re absolutely delicious! And remember: One properly eats a scone just as one eats a dinner roll: break off a bite-sized piece, add “embellishments,” and pop it in your mouth. Repeat. Repeat. Repeat! Knead the dough for a minute or so, until smooth, on a lightly floured board. Dear Santa, I Want This Teapot!